Ex-Netherlands international and Dutch national youth trainer Ahmad Zulfiqar came to Gingins for a high level coaching course for U15s and U17s in the weekend 1st & 2nd March 2014. 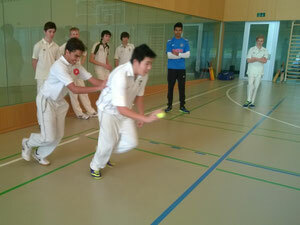 While many were still in the mountains enjoying the skiing, a group of enthusiastic players from Gingins and various other youth clubs, including Basel, Cossonay and GRYCC, were instructed in advanced batting, bowling and fielding techniques. 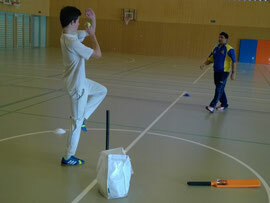 For ‘Zulfi’ this was the first visit to Switzerland and he was pleasantly surprised by the skill level of the players. Already during the coaching, increases in skills were visible and, as Zulfi told the players ‘with a few days of extra coaching, especially on one-to-one level, your skill level will substantially increase’. For the players, this weekend was a good preparation for the summer season and they are looking forward to practice their newly acquired skills. For further information regarding the Gingins Cricket Club coaching weekend, contact Arnold Bücheli.